The uptake of solar panels in Perth in recent years has been rapid. The popularity of PV (photovoltaics) in Western Australia’s capital is largely due to the plummeting cost of solar panels, Perth’s high level of sunshine and favourable climate, generous subsidies (that are also available nationally) and the increasing cost of electricity. For the people of Perth solar is a an obvious strategy to not only go green but save the green in your wallet as well. Given all that Perth has going for it, it’s not surprising the average system size in the city is 4.98kW compared to the Australian average of 3.15kW. While there are only 146 PV installations in Perth’s 6000 postcode (September 2016), that’s just the CBD. Tens of thousands of arrays are installed across Perth’s metropolitan area and outer suburbs – and more than 440,000 across Western Australia – that’s millions of PV modules!. Suburbs in the metropolitan area often feature in Australia’s top 20 postcodes and around 18 per cent of homes in Perth have solar panels installed. The following Australian Photovoltaic Institute (APVI) map indicates the percentage of households with rooftop solar power systems in the region as at June 30, 2016. A 5.2kW solar power system installed in Perth can return a financial benefit of up to approximately $2,000 a year; however it’s important to note financial gains, if any, will vary depending on the installation circumstances and the way power is consumed by a household. By also adding battery energy storage, Perth solar households can reduce their mains grid electricity consumption by up to 80% and make the most of their rooftop-generated energy. As with the financial benefits of installing solar panels without storage; this figure will vary according to circumstances. You can get a rough idea of the impact energy storage can have using our solar + battery calculator. The following is an example of an estimate involving a household consuming 16kWh of electricity a day – bear in mind the above applies; i.e., this is just an approximation and your own situation will likely vary. Subsidies for the installation of solar panels in Perth and its suburbs are the same as throughout Australia. The major subsidy is the Solar Credits scheme, which is based on certificates that are used (in most cases) to gain a point of sale discount that can be thousands of dollars, depending on the size of the PV system. In addition to this subsidy; Perth’s system owners can also take advantage of feed-in tariffs, which currently pay 7.1 cents per kilowatt hour for all surplus electricity exported to the mains grid. On average, Perth’s Central Business District receives solar irradiation levels of around 5.35 kilowatt hours per square metre daily; making it an ideal area for installing PV modules – and it’s a similar story throughout much of the metropolitan area. Ideally, solar panels installed in Perth should face a northerly direction, but east/west splits are becoming more commonplace. An acceptable panel angle range is 16° to 26°, with the optimal angle being 21°. The following is estimated daily output, averaged over a year (optimal configuration). The best month for electricity generation from solar panels in Perth is January. If you’re curious about how many solar panel systems are installed in specific Perth suburbs and how they perform; here’s a selection of links. For other suburbs in Perth, you can run a search here. Wherever you are in Perth or Western Australia, we can help you go solar and slash your electricity bills. If you’re also interested in boosting your energy independence with a battery system, we can assist there too. Energy Matters is an award-winning company that has been installing solar panels and battery storage across the country for more than a decade. Contact our friendly experts on 133-SUN for an obligation-free chat or submit for a quick solar quote. 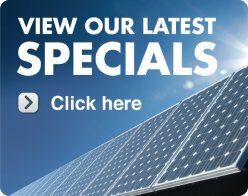 If you’re in the state’s capital check out our specials on solar panels in Perth.